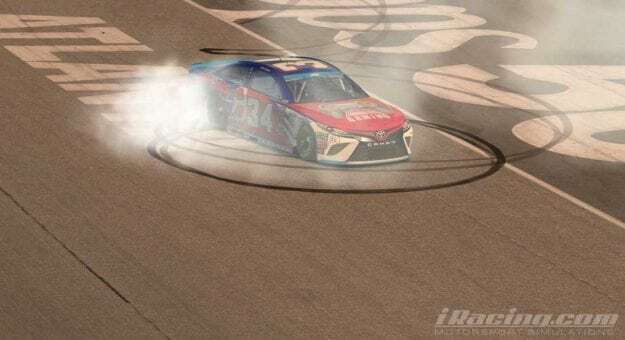 Matt Bussa punched his ticket to the championship round of the NASCAR PEAK Antifreeze iRacing Series Tuesday night after holding off a late charge from Michael Conti at Atlanta Motor Speedway. Conti, who started from the pole and dominated before falling victim to an untimely caution, carved his way back through the field and was within striking distance of Bussa with 30 laps to go. For the next 30 circuits Conti tried everything he could to pass Bussa but was unsuccessful. Multiple times Conti was able to draw alongside and even ahead of Bussa in Turn 3, but Bussa kept his momentum by using the high groove and fended off each attack. With laps winding down, Conti looked to make one final challenge, closing to Bussa’s bumper as the two took the white flag. However, Conti got loose off Turn 2, breaking his run and handing Bussa his first NASCAR PEAK Antifreeze iRacing Series victory. Conti, already qualified for the championship round thanks to his victory at Darlington, finished just over three-tenths of a second behind. Nick Ottinger followed in third with Ray Alfalla in fourth. The series’ most recent winner at Indianapolis, Logan Clampitt, completed the top five. Conti led from the pole and stretched out a comfortable margin over Brian Schoenburg early. Then on Lap 65, still with a healthy lead, Conti chose to pit for routine service under green. The early pit stop would allow him to stretch his lead, but if a caution flew before others had pitted he would lose track positions or be stuck on older tires. Unfortunately for Conti the caution flew on Lap 71 when Brad Davies crashed off Turn 2 and collected a few others. Conti had unlapped himself but decided to pit with the rest of the field to be on equal tires. He would restart 22nd with 91 laps to go. On the restart, Clampitt jumped out front and would go on to lead 46 laps. Clampitt’s biggest challenger for the lead? None other than Conti who passed 20 cars and ran down Clampitt 40 laps after the restart. Before he could take the lead, though, Conti pitted for a final time for tires and fuel. The race-winning pass ended up occurring during the round of pit stops as Bussa stopped a lap before Conti and used the fresh tires to his advantage. While Conti looked to have the quicker car and one lap fresher tires, Bussa found a line that was both fast and prevented Conti from clearing him for the lead. With only one race left in the first round of the playoffs, time is running out for the four drivers on the outside looking in. Bussa and Conti are locked in with wins while Ryan Luza and Alfalla are currently in on points. With a 36-point gap to fifth, Luza looks safe to transfer. Alfalla is in a more precarious position as Ottinger is only 12 points behind in fifth. Keegan Leahy, Bobby Zalenski, and Nickolas Shelton are 24, 27, and 28 points behind, respectively. A win would most likely be required if any of them hope to transfer. Dover International Speedway plays host to the penultimate race of the 2018 season, and with two transfer spots to the finale still up for grabs, look for strategy and daring moves from the drivers currently fifth through eighth. Who will join Bussa and Conti in Homestead to compete for the championship? Find out when the NASCAR PEAK Antifreeze iRacing Series hits the Dover high banks in two weeks.